Sprawling Henry county center to welcome numerous new restaurants. South Point, a 700,000 square foot multi-phase development in McDonough, will soon welcome a host of new eateries. Already home to such popular national retailers as T.J. Maxx, Kohls, J.C. Penney and Academy Sports, new restaurants and likely new retailers are in the immediate pipeline. The center is located on Highway 20, just off I-75 in Henry county. The first phase of the project opened in the fall of 2008 with JCPenney and Kohl's. Hobby Lobby and Hilton Garden Inn, a limited service, mid-priced hotel, joined the mix in 2009. 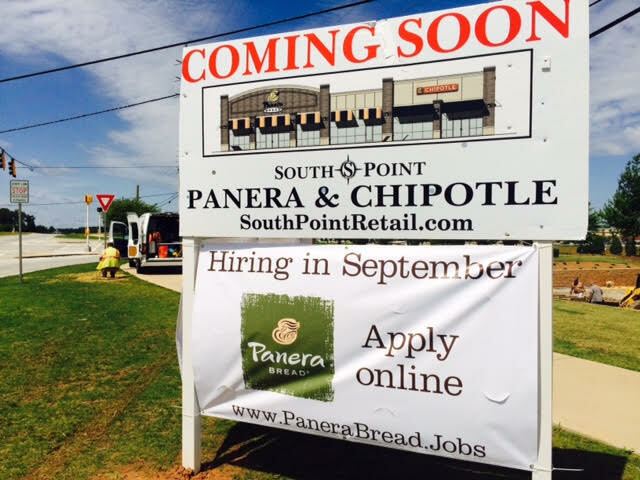 Panera Bread, Chipotle Mexican Grill, Five Guys, Pie Five Pizza Co., & Menchie's Frozen Yogurt are all under construction in the center. Most notable of the additions are Pie Five and Menchie's. Fort Worth, Texas-based Pie Five Pizza Co. has existing commitments in Newnan and Duluth, making this latest location just their third known lease in Georgia. Encino, California-based Menchie's has closed at least two metro Atlanta locations (Buckhead & Johns Creek) but apparently still sees growth opportunities in less competitive markets such as McDonough. As I reported last year, Wichita, Kansas-based Freddy's Frozen Custard & Steakburgers opened a restaurant in the center last year. Freddy's, a direct competitor of Indianapolis-based Steak 'n Shake, marked its entrance into Georgia in McDonough and has since added a second location in Athens. In addition to the restaurant openings at South Point, a number of other openings are planned for the area. A few miles away from South Point, a new, nearly 9,500 square foot Wild Wing Café is planned for 36 Mill Road. Also on Mill Road, new hotels from Home2Suites, Hilton's extended stay chain (60 Mill Road) and La Quinta Inn & Suites (100 Mill Road) are both planned. The 92-room, all suite Home2Suites is about half done with plans to start La Quinta's construction when 100% complete. As I reported in 2013, Atlanta's first Home2Suites is located in a historic building on Walton Street in downtown Atlanta. Currently the downtown Atlanta Home2Suites in scheduled to open later this fall. Restaurants & retailers looking for success need look no further than Henry County & Atlanta's New South where a goldmine awaits their arrival! Henry County is underserved with 210,000 residents with money to spend driving long distances to shop & eat. Many of our residents say time after time they are tired of having to drive north for restaurants, upscale merchandise, fine Dining & top shelf services. Freddy's Steakburger's mentioned in the article shattered sales records for the company with $142,000 in sales first week for the company! When affluent customers are asking for your services business should be lined up to come to Henry County & as you see they finally are! The biggest underestimation of Henry County is it's draw is far greater than 3-5 miles as shopper south of Macon & north to the city of Atlanta frequent Henry County! Henry County is indeed the place to be for new business success! Goldmine ... affluent customers ... Henry County? Good restaurants with tasty dishes will definitely thrive in Henry County. My friends and I have been asking for more fine dining restaurants. Some suggestions have been Bonefish Grill and Carrabas. I hope more restaurants will consider opening in Henry Co. I'm pretty sure I've seen that Henry County marketing spiel elsewhere. Cute, guys. They post that exact same Henry County marketing spiel on every high end homebuilders' Facebook page every few months. The thing they don't understand is that the median income levels and density/number of higher income households in Henry County simply don't support the high end retail, restaurants, and housing they desire. It's simply a matter of supply and demand and not a knock to the quality of life in their county in any way. The vast majority of the upper income jobs are on the north side of town and likely always will be. As a result, there simply never will be enough affluent people in Henry County to support what these marketing people desire. The small quantity of affluent residents on the south side have all chosen to congregate in the Peachtree City area. I don't see that ever changing...success breeds success. PTC is the successful, upper income node on the south side of town and it always will be. Yes I agree with you about Henry County being full of affluent consumers. Everytime I go to the Wal Mart in Stockbridge my car is the only one in the parking lot less than $90k. I'm also friends with a real estate agent who told me all of the C level executives at Coke, Delta, Home Depot etc. are selling their homes in Buckhead, Ansley Park and Sandy Springs and making their way to McDonough. Sarcasm aside Henry County is like any other suburban county in metro atlanta. It runs the full gamut of incomes from very poor to wealthy. The one problem Henry will have a tough time overcoming though is that it's neighbor to the North is Clayton County which is a pretty horrific place. Until Clayton starts to get better Henry probably won't see an influx of high end retailers. As you can see, just like most of the country, Henry County is divided. Hate for no reason. I've read other articles by Atlanta Tomorrow's New Today and none of them have the hate on their comments like the article for Henry County does. It's embarrassing. Btw...Fayette County is next door to Clayton county as well. All of the folks from Riverdale is shopping at the Wal-Mart in Fayetteville. Even the small percentage of affluent citizens of Peachtree City have to travel to North Atlanta for upscale dining, shopping and specially for entertainment. And if Macon can have a Bonefish Grill restaurant, then why can't Henry County? Get over yourself. No one hates Henry County. Everyone was just responding to Elton's marketing spiel written by the Henry County Chamber Of Commerce. The reason that companies see fit to put upscale restaurants like Bonefish (although I'm not sure I would consider that upscale but that's neither here nor there) in a city like Macon is because of Mercer. Any economist or marketing exec will tell you universities employ a decent amount of people who live in the area and are well compensated. Sorry to say but until major companies start moving to the south part of town Henry will continue to struggle top notch dining and shopping. Maybe once the film studios really get cranking (Tyler Perry project, Pinewood studios in Fayetteville) in that part of town you will start to see the dining and shopping choices improve. I live in Gwinnett and "hate" on it all the time here in postings. Gwinnett has more affluence than Henry, but the facts are those incomes are leaving Gwinnett. Pockets of every area that are underserved are seeing booms just like 124 Scenic Hwy in Snellville. No municipal marketing campaign or resident driven social media push can make retailers come to your area. Gwinnett could have cheerleaders begging them to come here and Cobb residents could "hate" on here too. Just because people drive expensive cars, live in 5000 sq ft homes, and purchase "luxury" goods does not mean they are affluent. Conspicuous consumption has slowed since the recession, but it is certainly not dead. Bonefish is not a high end restaurant. They are a chain that everybody will beg to come, but only a fraction will become loyal patrons. Corporate retailers and restaurants take risks and come and go all the time. I certainly wasn't hating on Henry County in the least bit. I was simply making a statement grounded in logic and reason. High end retailers and restauranteurs flock to areas with high concentrations of affluent households. For another example, look at Sandy Springs. It's the land of the "haves" and the "have nots" with its mix of super wealthy households living in the thousands of million dollar mansions sprinkled throughout the city alongside the dozens and dozens of super low-end, slumlord-esque apartments complexes that line Roswell Road. Chances are Sandy Springs has a significantly greater concentration of households living under the poverty line in these Roswell Road apartments than all of Henry County. Nonetheless, Sandy Springs is still home to numerous high-end retailers and restaurants because they also have that huge concentration of affluent households living in all the McMansions. No different than observing that high end retailers are more likely to open locations in Alpharetta before they would in, say, Loganville or Powder Springs. Again, all three are probably equally great places to live and raise families. There's just a greater number of affluent households in Alpharetta than the other places, hence the reason that Avalon is located in Alpharetta rather than Powder Springs. not to highjack this into a conversation about Sandy Springs but the above comment is completely off base. While those apartments along Roswell Rd are certainly rundown they are far from "super low end, slumlord-esque". The median household income in the census tract running along Roswell Rd between Pitts Rd and Abernathy Rd (which is the largest concentration of those apartments with virtually no single family housing) is $44,000 and the poverty rate is all of 11%. $44,000 incomes won't support places like Bonefish Grill or Williams-Sonoma, so there's obviously more affluent people living elsewhere in Sandy Springs. That was my only point. Also, chances are that the people living in all the $200,000 to $300,000 little slices of paradise in Henry County are making more than $44,000 or else they wouldn't have qualified for their mortgages. Those fine Henry County folks making more than $44,000 are doing quite well but not quite well enough to attract the likes of Bonefish Grill or Williams-Sonoma. That was my other point. It's true we need more fine dining,but people probably can't afford it.thats why they put fine dining in atlanta,where people income is a lot higher.if they put it in mcdonough people will hardly go.or just go as a couple.